Pikes Peak embodies the history of America perhaps more than any other mountain in the United States. “Pikes Peak or Bust” was the rallying cry of thousands of prospectors and entrepreneurs who hoped to profit from Colorado’s Gold Rush of the 1850’s. After an inspirational visit to the summit in 1893, where she observed “purple mountains majesties above the fruited plain”, Katharine Lee Bates wrote her song “America the Beautiful”. 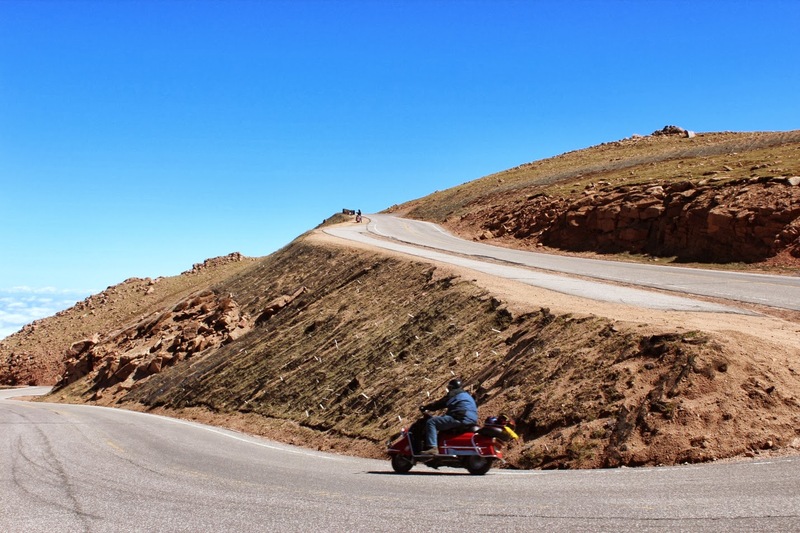 Since the first car sprinted up the dirt path to the top of the 14,115 foot mountain in 1913, Pike’s Peak has been the site of numerous hill climb road races by any number of motor-powered vehicles. This history served as the background for HeinkelFest 2013; could an eclectic group of German scooter enthusiasts successfully climb to the summit of the easternmost Colorado “Fourteener” on their 50+ year old machines? HeinkelFest 2013 was the third biennial Heinkel rally sponsored by Mike McWilliams of HeinkelTourist.com. Mike revived the spirit of earlier Heinkel meetups of the 80’s and 90’s with the first HeinkelFest in 2009. With this third rally in the series Mike has managed to change and enhance the rally to include more and interesting things. I attended the 2009 Heinkel Rally, which showcased the great riding in and around Colorado Springs, a mid-size gem of a city situated at the base of the Rocky Mountains about 90 miles south of Denver. This year I dreamed of bringing my Heinkel Car (you can read about it in my blog, http://Heinkels.blogspot.com) to the rally, and then settled on a plan to bring my scooter, but the cost for shipping either one was prohibitive, and my work schedule would not allow for a 3,500 mile round trip. Upon hearing of my plight, Mike generously offered to let me use one of his exquisitely restored Heinkels. 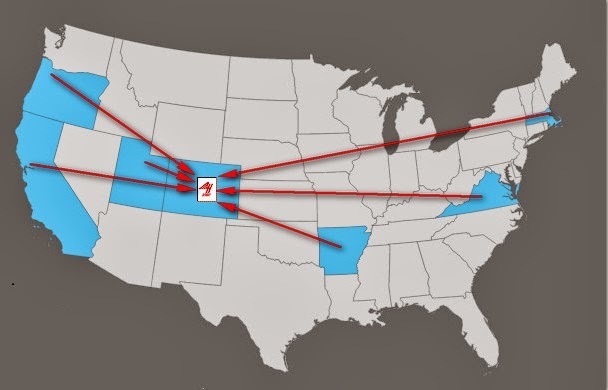 This year’s attendees came from all over the US, representing 7 states as far away as California, Oregon, and Massachusetts. The rally started on Wednesday with an afternoon full of introductions and some hands on tech talk. 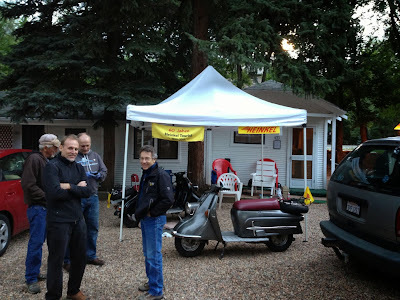 Many of the attendees are active on the Heinkel Scooters Facebook group, so it was a great opportunity to meet some online friends in person. This year’s host venue was the Green Willow Motel, a charming, family-owned 1930’s motor-court style motel with a series of cabins with porches surrounding a gravel and grass parking area. We claimed an area of the motor court for our rally and erected a tent that Mike adorned with signs provided by the Heinkel Club of Germany. This served as our impromptu workshop and gathering area. The Green Willow owners let us work on our scooters in this area. 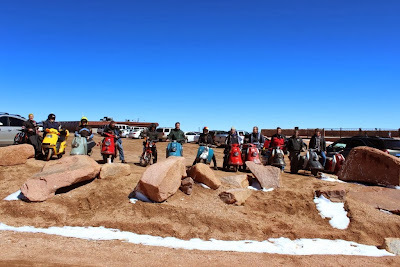 We prepared some of the scooters for high altitude riding by downsizing the main jet. I was not about to let a golden learning opportunity pass me by- I came with three pages of questions in my little notebook! By the end of the first hour I had all of my questions answered. It’s amazing what the collective experience of a group of enthusiasts can answer. Our first organized trip was on Thursday when we rode to Palmer Lake, northwest of Colorado Springs. Coming from the East Coast it’s easy to forget the effect that elevation has on temperature. It was downright cold at the beginning of the ride although it warmed up quickly. Palmer Lake wasn’t much of a lake; in fact, it was completely dried up. In a way it set the stage for the return portion of the trip which went through some fire ravaged areas. Earlier in the summer parts of Colorado Springs suffered from terrible brush fires that burned hundreds of homes. The fires left their mark unevenly; we rode through untouched areas surrounded by places where the fire damage was extensive and complete. We saw houses burned to their foundations, with burned vehicles and furniture still in the places where they were left when the residents fled. The fires of the last few years have caused some other issues as well. Without live vegetation to hold the hillsides, regular flooding has become more commonplace. Colorado received some unusually heavy rains in the week before we arrived, resulting in large amounts of dirt and scree deposited all over the roadways. The floods also took their tolls on local businesses and our motel. 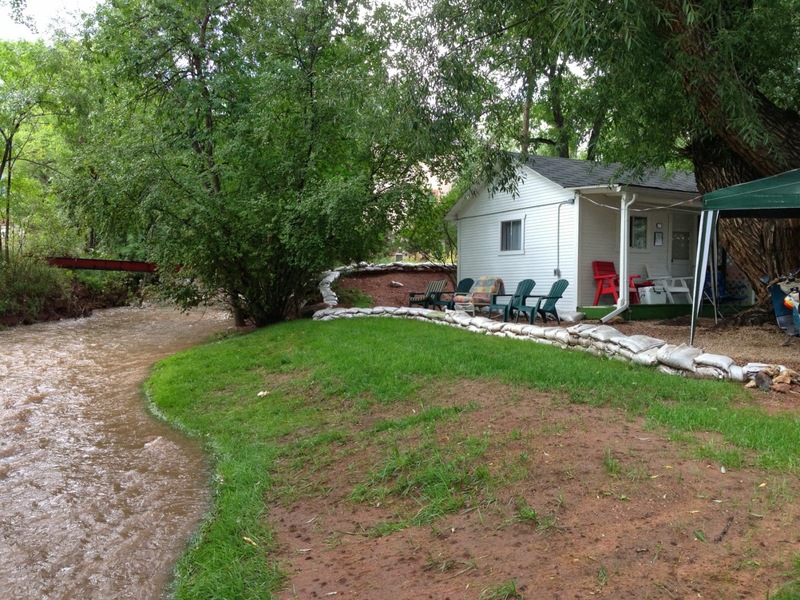 Sandbags and swollen streams were evident right outside of our cottages. While we could ride around the dirt and fire scarred areas, the flooding impacted our dinner plans. The rains caused a water main break and the town of Manitou Springs imposed a drinking water ban, which meant we had to find alternate dinner plans. Some friends of Mike have developed some vegetarian fare to replace soy based tofu with black beans. We never got a chance to sample it. It’s rare to have a grouping of vintage scooters and have them all running perfectly. In order to climb Pikes Peak we needed to have them in optimal condition. After Wednesday’s dinner we made some final adjustments and parts replacements to head out on our epic hill climb. After breakfast on Thursday we headed out of town about 10 miles to the base of Pike’s Peak. We wanted to reach the summit by noon. The Rockies are known for afternoon showers and wind, and we had enough of a challenge without added complications. The road to the summit is about 19 miles long with an elevation gain of over 6300 feet. After paying our $8 entrance fee we started up the mountain. The scooters naturally fell into groups of two or three, and we’d keep an eye out for each other in our impromptu groups. The first several miles were a steady climb interspersed with some flat areas. I rode at between 30-40 mph on many of these areas, alternating between second and third gears to stay in the 175cc engine’s powerband. These areas were good practice for the final run up to the summit, which was a series of switchbacks through intriguingly named areas such as “Devil’s Playground” and “Bottomless Pit”. It took about 45 minutes for the first riders to reach the top. Once at the top we hoped to park where the National Park Service webcams could show us online. Most of us were at the top when someone else at the summit came over to tell us that one of our group was pushing his scooter up the road. We ran over to help. It’s hard enough to just walk at 14,000 feet elevation; pushing a 340 lb. scooter is an entirely different matter. We were exhausted from pushing and oxygen deprivation, but we made it. 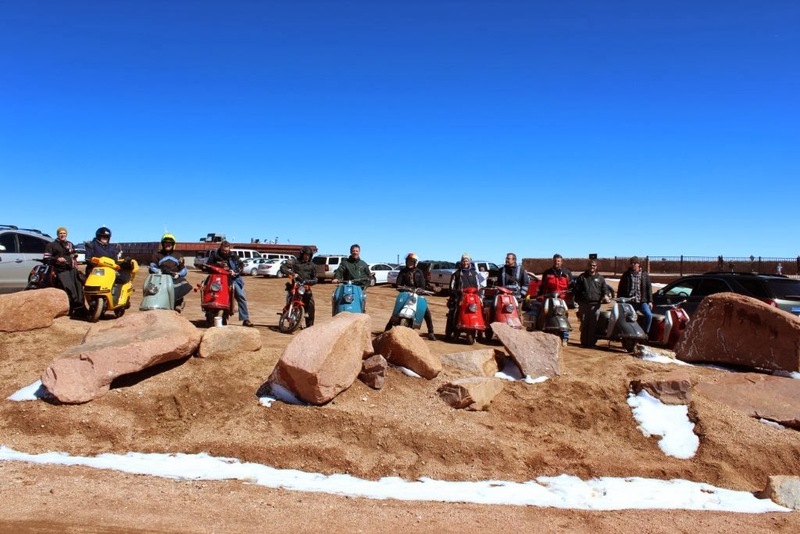 The summit of Pikes Peak is large and relatively flat, with plenty of room for several typical top of the mountain attractions; parking, a cog railway tram station, a restaurant and gift shop, and a photo-op sign. The specialty of the snack bar is a cake donut, which people say is delicious, but for me the appeal was more the fact that they can actually cook anything at such a high elevation. I always remember as a kid reading the directions on a box of brownies and wondering about the high altitude directions and where on earth you would even need to use them. Well, Pikes Peak is where you use high altitude directions (I would assume). The donuts weren’t that good, and I even sprang for the expensive “fudge covered” donut that was five times more expensive than the basic “Pikes Peak World Famous” donut. During our ride we went through several climate zones, and when we reached the top even the clouds were below us. The temperature hovered around freezing. It was a great chance to wear the Heinkel Hat my wife knit for me. 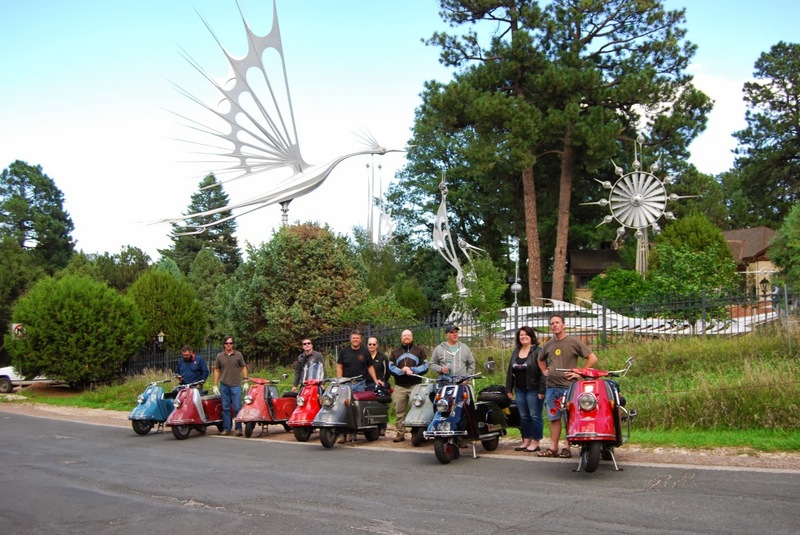 After we took a series of individual pictures on scooters in front of the Pikes Peak sign we proceeded down the mountain. Pike’s Peak is a mountain with two challenges. The challenge of the way up is simply getting there; on the way down the challenge is using engine braking and not relying on the brakes while you navigate hairpin turns and avoid rental car drivers flying down in “D” while they burn up a lifetime of brake wear in about 20 minutes. The National Park Service has a lot of experience with this, so about a third of the way down they make everyone stop while they take infrared temperature readings of your brakes. Too hot and you have a mandatory stop at the gift shop until both you and the brakes cool off. The ride was challenging and exhilarating at the same time. Once we got back to the hotel we took a rest- the ride and elevation made you want to take a breather. 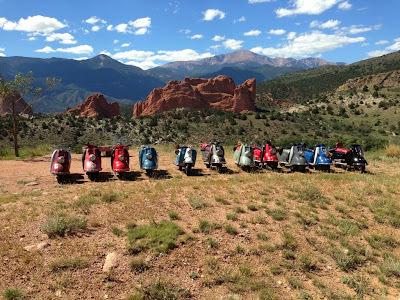 On Saturday we took a ride in the Rocky Mountain foothills to Garden of the Gods, an area of beautiful sandstone formations, and through the Broadmoor resort area, with its spectacular views of downtown Colorado Springs. We visited the famous Starr Kempf Wind Sculptures. These steel sculptures, some 50 feet tall, were designed by a local artist to respond kinetically to the slightest breeze. For an afternoon break we rode over to Colorado Spring’s Sportique Scooters, where they had a small reception for us. We also got to see their collection of vintage Lambrettas and Vespas. After the Sportique reception we engaged in some Heinkel games. This not-to-be missed part of Henkel Fest consisted of four challenges, a mental Gymkhana of sorts. Best of all, Mike provided prizes such as stickers and magnets. I have to hand it to Mike; he was very creative. One of the challenges consisted of a display board where Mike had hung 16 different Heinkel scooter parts. The winner was the one who could identify the most. I was a little rusty after having worked on Kabines for the last year, but I was happy with my performance. Another challenge, dubbed “eye test”, presented six pictures of vintage Heinkel scooters. 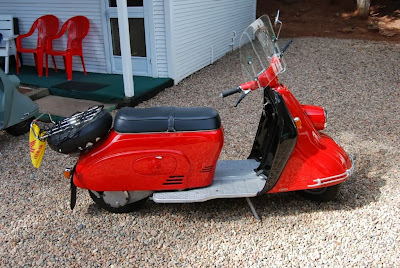 For each picture you had to identify the scooter model, the special features, and the color (not quite fair since the pictures were black and white). Much to everyone‘s surprise, we all knew a lot more about these 50 to 60 year old scooters than anyone would have thought. After a brief rest we rode to our farewell dinner at the Edelweiss Restaurant. Edelweiss is a Colorado Springs landmark, and the site of one of Colorado’s only Beer Gardens. This dinner has become a tradition at HeinkelFest. We had a table in the beer garden and had a great German meal. Sunday was a good bye day. The event was a great success. Mike managed to collect 11 Heinkel scooters in one place, which is probably a record for any assemblage outside of a dealership. Each of us made new friends, exchanged contact information, and are sure to keep in touch. What will be the future of the HeinkelFest? We discussed changing the venue and moving to the west or east coasts. There’s different terrain, more Heinkels, and the chance to meet more Heinkel friends. Maybe we’ll even attract some people from the vibrant overseas Heinkel groups. We’ll know soon!